Wouldn't that be cool if you could scratch and sniff this? I used to love those scratch & sniff books as a young kid. You know you're going to be a foodie when you had a collection of the 'scratch & sniff' books as a youngster. Didn't matter that the sniff part lost it's 'sniff'--you could still smell it, no matter what. I had 'pat the bunny' book too; loved the part of dad's rough skin. I hate to be one-sided here, I know the scone is supposed to be the best in show here, but in all honesty the cinnamon-cider cream cheese glaze just steals it. Not too sweet, and just the right amount of cinnamon to cider to cream cheese ratio. I love when it all balances out. Try these, that cider bite with the gentle pumpkin scone? Oh heavenly. Don't get me wrong, the pumpkin scone is stellar, I'm just bragging about the glaze--it melds perfectly with the slightly sweet-pumpkiney scone. Of course I had to add sprinkles. I know scones don't really call for sprinkles, but I got these all natural sprinkles from Whole Foods. There's no dye, no chemicals, no junk--love that. 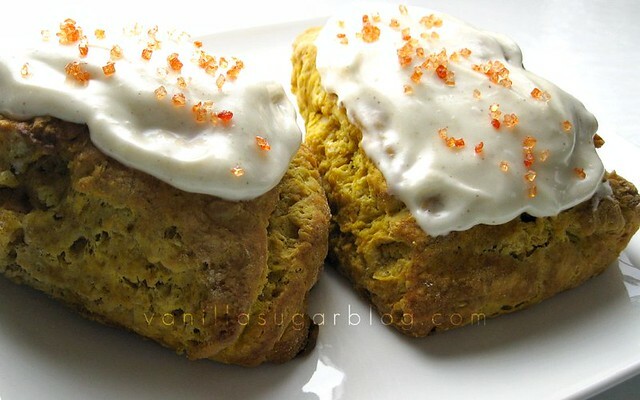 That orange color is just so fabulous for these scones. And they have a taste to them as well. Look for them at Whole Foods as they have beautiful array of colors. Grate your butter with the large holes of a cheese grater. Then back into the freezer until you’re ready to use them. Preheat your oven to 425 degrees F. (I have a confection so I did 400 degrees). Line a large baking sheet with parchment paper. Dust your work space with generous amounts of flour and place dough down. You might want to dust your hands with flour as you will need to shape this dough into a large circle. Dough will be sticky. Once you have a ball, gently press down and out, forming the dough into a flattened circle. About 8-10 inches round. 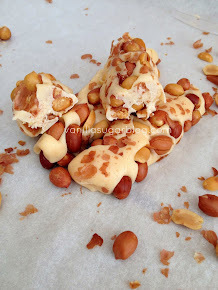 Dough will crack when you press down, just pinch & repair as you go along. Dust a large, sharp knife with flour and cut the dough into six triangles. Slide the knife under each triangle to help you lift and transfer it to the prepared baking sheet. While scones are baking assemble the glaze by adding in the soft cream cheese to a medium size bowl, add in the sifted confectioners sugar, cinnamon, and a couple dashes of the apple cider. Don’t add in all the cider at once; it’s better to add in small doses than larger ones. Get out the handheld mixer and beat until well mixed, no lumps are present. You can add as much or as little apple cider depending on how thick you like your glaze. Let scones cool a bit on a rack before glazing. I used to love the scratch and sniff stickers. Also, the markers that smelled fruity. Probably not a good thing to teach kids though, sniffing at a young age. Anyways, I LOVE your scones. That glaze puts them over the top! These look decadent! Cinnamon-cider cream cheese glaze... what a flavor combo. Dear Dawn, I love you. Please come bake for me all the time. These look delish! I love seeing your recipe - I made one a few weeks ago and used about the same amount of pumpkin. I have been thinking that I should try it again and use more pumpkin, even though the pumpkin flavor was pretty strong. The glaze looks mouth watering! I NEED A SCRATCH & SNIFF FOR THAT SCONE!!! I've always wondered why no one has invested scratch and sniff computer screens. That would be an amazing seller. I'm drooling over that cream cheese glaze. I need myself an afternoon snack right now. Your scones look perfect. I wish mine didn't have flour spots from my overmixing fear. Mine would have definitely benefited from your glaze too. I used to be obsessed with those books! Oh my goodness more than just a scratch and sniff... I need a scratch, sniff, and lick because they look absolutely amazing I wish I could just pull one out of my screen. I'm closing my eyes and imagining taking a HUGE bite out of one, licking my fingers with that delicious glaze.... Yum! that glaze sounds amazing! i wish i had a scratch and sniff screen!! These look wonderful with the glaze. Cinnamon-cider cream cheese glaze sounds amazing, wow! I want to smell that scone!! Looks amazingly delish! Wish I had one for dessert right about now! Forget the scratch and sniff, I want to eat it! i love your concoctions! Those are just screaming "Fall" -- the color, the flavor combination. Wonderful. Oh man, I wish scratch and sniff TV and internet really worked, especially with cinnamony baked goods. These scones look so good with that glaze! the sprinkles are the perfect touch. cinnamon-cider cream cheese...WOW! there's a lot of flavors going on with this scone..
imagine the prosperity you'd earn if you created such an awesome application. you'd never have to lift a finger again. the scones look great, but truth be told, all i need is a bowl, a spoon, and a batch o' glaze. yum yum yum!!! these sounds lovely, definitely a must for Halloween season! I need to eat these now! ...no seriously..right now! Forget scratch and sniff. We need a way to just beam the actual food to each other! These are gorgeous! Mind sending me some for breakfast today? You are a genius! Your food photography is beautiful. I plan to try this recipe. 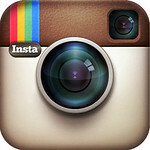 Your pictures make your food come to life! Looks lovely, even without the sniff! Yum. I just came upon your blog and love it!! 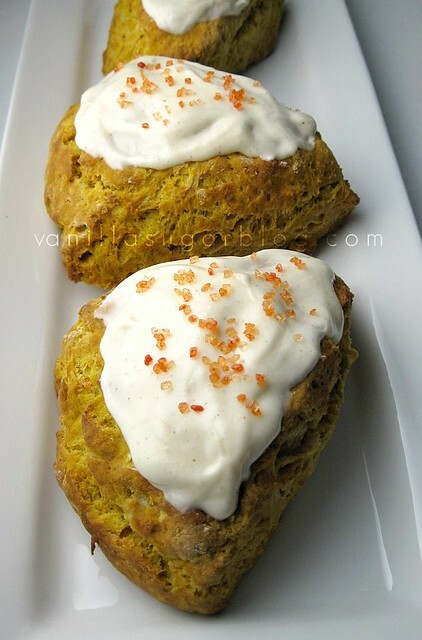 These pumpkin scones are on my list of to-dos!! Yes this post need scratch and sniff! That topping is to die for. I love it! I must start baking now. That glaze looks amazing on those scones! These are beautiful! They are the epitime of autumn foods that I love so much! Thanks for the lovely post! 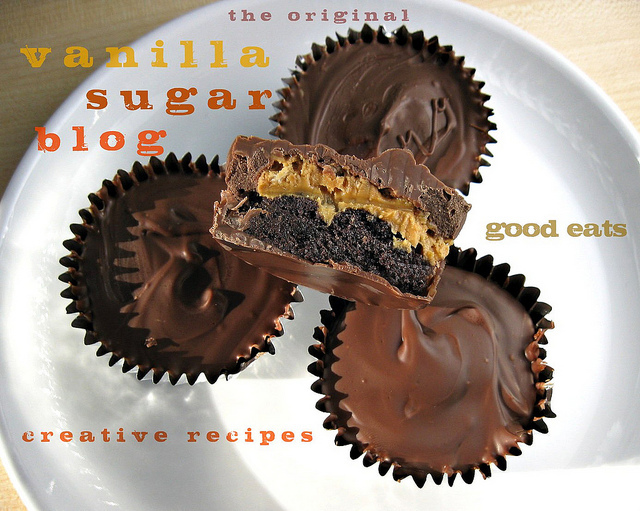 I will be making these. Gotta catch up here! Man, I'm missing out on some good stuff. The scones look beautiful. Love the cream top and sprinkles. How cute! Love scones and I think your glaze is unusual and delicous. Can think of tons of things just to use the glaze on- pumpkin muffins to name just one. I scratched, but alas, not a whiff. Let's work on that! These are lovely Dawn I would love to smell the aroma mmmmmmmmmm. The sprinkles are really gorgeous! The cinnamon-cider cream cheese glaze looks devine. I can almost taste it. I would love to be able to scratch and sniff it. I plan to make this soon. Have a wonderful day. I do love me some scones! Your cinnamon-cider glaze sounds heavenly! In the UK we don't glaze our scones, we slice them and put things inside. I will definitely try that glaze but maybe for a cake instead. And the scone sounds lovely. Tinned pumpkin costs a fortune here so I'll have to experiment with alternatives. The logical idea is roasted butternut squash I think, making sure it's not too wet. Will let you know how it turns out! Organic Brown Rice Syrup, Organic Evaporated Cane Juice, Organic Brown Rice Syrup Solids, Pectin, Citric Acid, Green Tea Extract, Colored With Black Carrot Juice Concentrate, Natural Flavor, Organic Sunflower Oil, Carnauba Wax. Oh my serious gawd, this is heaven on a plate Dawn! How sesaonally yummy! Cinnamon cider cream cheese glaze? Seriously? I want it. Now. Yes, I will sign the petition to make blog scratch n' sniff! LOL! I love the sprinkles Dawn, they really add a festive touch to those mighty fine looking scones! The glaze does look over the top good!!! I have to try these out with the glut of pumpkin I have from the garden. These look fabulous and I love the sprinkles! I wish I had one for breakfast tomorrow, actually I wish I had one right now! I love these! They look seriously amazing. That glaze sounds incredible. Bet they made the house smell so yummy. The glaze is the killer!! Love the sprinkles!!! All natural - I must get some. I've been playing with scones lately too, but mine have been savory. How funny is it that I now have five sugar pumpkins rolling around here in prep for a whole bunch of pumpkin goodness. This recipe is perfect for my stash (including two still hiding in my trunk because I didn't want the hubby to see them). I'm a bit out of control with the gathering lately. When are you going to the bank with a portfolio of recipes and pictures so you can get a loan and open your restaurant? Seriously, people in your town are totally missing out! Go, now, and I'm flying out from MN! oh wow, these are just lovely, and i bet the flavors are out of this world! I've still never tried making scones - these look wonderful. Love the cinnamon-cider glaze. Mmmm. Your scones look so light and dense the cinnamon cider glaze...are you kidding me...I'd lick the glaze off all the scones! There are pumpkins, pumpkins everywhere. They never go away...because they are good. Gonna have to try the grated cheese method. It's a proven strategy! My cousin had a scratch and sniff t-shirt with an ice cream. I was always scratching and sniffing her tshirt, lol! But now, I would really like to scratch and sniff your scones... well to tell you the truth what I'd really like was actually to eat them!!! These look absolutely delicious. 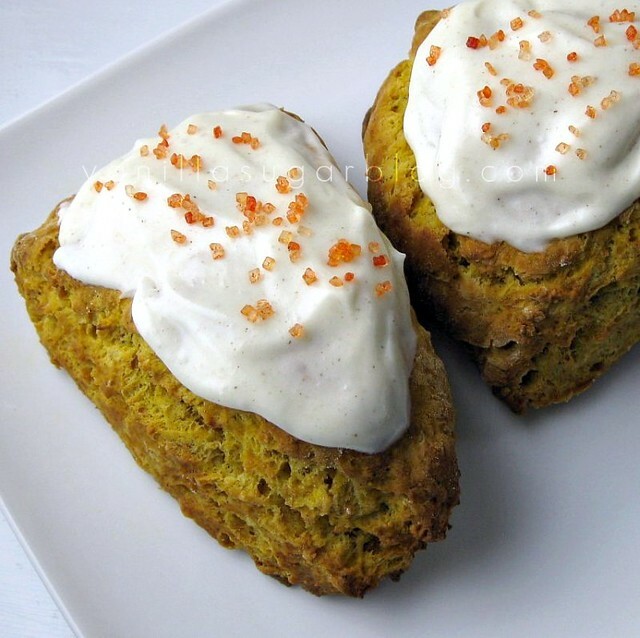 I love scone and now pumpkin scones!?! I'm in heaven, just extra clotted cream please! Still jealous that you have a whole foods because I keep trying to get them to open one here but *cry* no luck. Grated butter, huh - I will have to try these soon since I don't have scratch and sniff! Oh my, these look amazing, Dawn! yum yum yum! You know that I'm a pumpkin junkie. Just tease us with the scratch and sniff title... witty! These babies look like breakfast heaven girl! And everything in life could use some sprinkles.